The LED Lenser H14R.2 rechargeable head torch delivers extremely bright output in multiple settings and can be operated with rechargeable or standard batteries. Its universal fastener facilitates flexible mounting on clothing, a table, or a bike. It also includes eight programmable settings, a switchable rear red LED for extra visibility, advanced focus system technology for near to far viewing and a third head strap for extra comfort on long projects. The H14R.2 isn’t just a headlamp, it’s a lighting system. To see and be seen... LED Lenser head torch Head Fire Power Chip was declared best in test by the Stiftung Warentest, a non-profit German consumer organisation conducting independent product tests. LED Lenser are also proud of having emerged victorious in an internal test of the German Federal Armed Forces and of providing the troops with their lamps. The latest models of LED Lenser’s H Series are further developments of the award winning Head Fire Power Chip. Excellent workmanship, a unique optical system (patent pending), user friendliness, wearing comfort and extreme brightness let these models stand out from the mass of head torches. Traditionally light focusing systems have consisted of either a lens, or a reflector. Lenses have the advantage of emitting a homogenous light pattern for distances almost 70% of the light is scattered and lost. Conversely, while reflectors do a better job of capturing a higher percentage of light for long distances, when they are used for up close reading scattered light causes "rings" and "holes" in the light pattern leading to eye fatigue. In both these cases, the lumen count (brightness) loses its validity as light is misdirected and wasted. That's why LED Lenser decided to try something different. If you pull together the strengths of the lens and reflector into one combined system, you achieve clear, homogeneous light spill for up close reading and a sharply focused beam for long distance viewing. This is exactly what LED Lenser have done with the Advanced Focus System (AFS); a unique and patented lens/reflector optic. AFS means reading the map up close is easy on the eyes and then focusing to find the path or landmark in the distance, clear and bright. 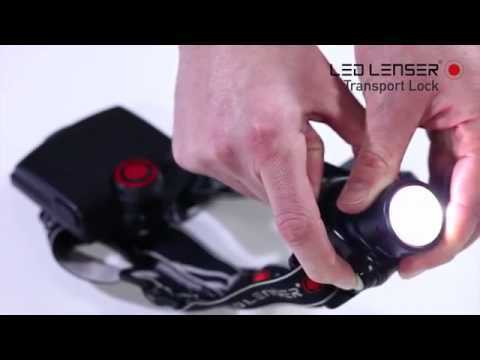 The LED Lenser H14R.2 Rechargeable LED Head Torch is supplied with a 5 year warranty.